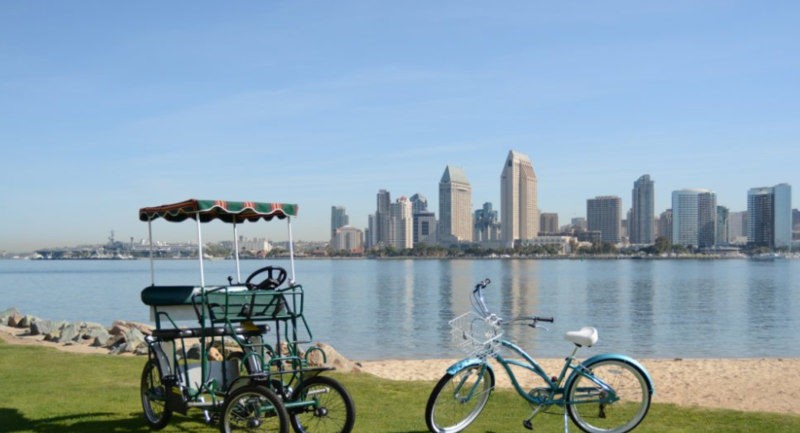 Renting a bicycle from Bikes and Beyond Coronado is a great, eco-friendly way to see the San Diego, and get some exercise. Bikes and Beyond offer rentals at low prices and keep up a great inventory for the busy weekends. Plus, their friendly staff will even break out maps and can also help you plan your bicycle riding adventure. They offer individual bicycles for adults (some even have baskets) and kids, surrey’s for a fun couples adventure or to fit the whole clan! You can even rent tandems, trailers & bicycles with baby seats! Take a tour of Historic Coronado Beach Hotel or explore Coronado Ferry Landing. In addition to great quality bicycle rentals, safety equipment is included in your rental! For your safety, you will also receive locks, helmets, and maps with all rentals! You can also find a wide variety of kites and cycling-themed t-shirts. Bikes and Beyond is an ideal starting location and fantastic view. This is the perfect fun spot for families who want to spend the day exploring all of beautiful Coronado!